I like to argue (for example, here) that one of the major reasons crowdsourcing has not yet become a mainstream innovation tool is a paralyzing uncertainty over the question which technical or business problem can be successfully solved by using this approach. In this piece, I want to shed some light on the issue by proposing a simple model that matches crowdsourcing to specific types of innovation. Market-creating innovations (“Creation,” in the authors’ parlance). This type of innovation takes place at the first stage of business model formation when firms search for a meaningful value proposition, e.g., product or service that would fulfill unmet customer needs (“job to be done”). Sustaining innovations. This type of innovation, which is an improvement in the firm’s core offerings, involves the creation of better products or services that can be sold for higher prices to existing customers. Efficiency innovations. 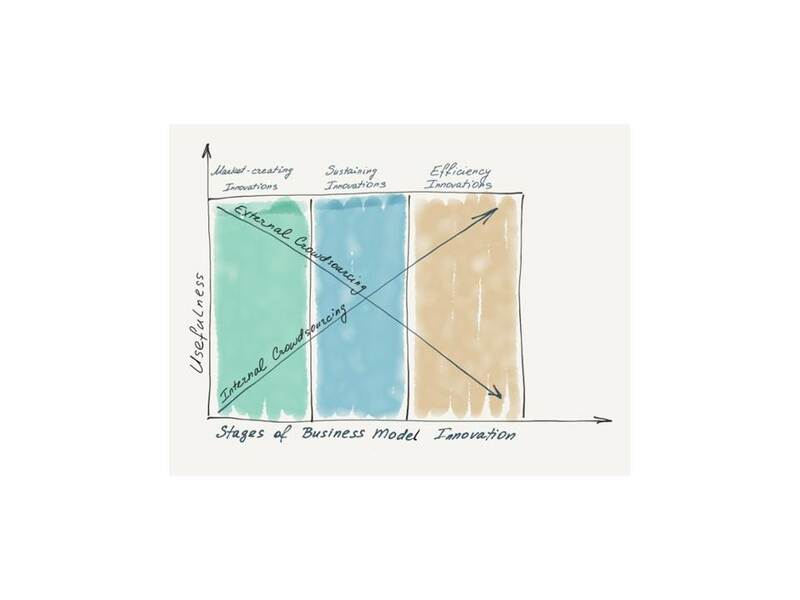 This type of innovation kicks in when sustaining innovations no longer generate additional profitability and the firms turns to cost reduction, mainly by optimizing internal processes. External crowdsourcing (EC). To describe EC, I’ll borrow its “classic” 2006 definition by Jeff Howe as an act of taking a job traditionally performed inside the firm and outsourcing it to a large (and usually undefined) group of people in the form of an open call. Firms can run EC campaigns by either employing open innovation intermediaries (such as InnoCentive, NineSigma and IdeaConnection) or by building external innovation portals, the last venue best represented by the Unilever Foundry. External crowdsourcing is mostly efficient when applied to market-creating innovations. When firms are designing products and services to fulfil newly discovered customer needs, they can greatly benefit from collecting input from an external “crowd,” a crowd whose size and diversity would vastly exceed the firms’ internal resources. Besides, EC often brings original, sometimes even unorthodox, solutions that are unlikely to be developed by internal R&D teams. EC can still be useful when applied to sustaining innovations, but only if the firm is able to clearly articulate the deficiencies of its current offerings and provide a precise and specific description of what a meaningful improvement in these offerings should be. External crowds can then come up with solutions that in many cases could be superior to those developed in-house. However, EC becomes almost useless when applied to efficiency innovations. The reason is not that crowds are inherently incapable of addressing operational, including cost reduction, challenges; the problem, rather, is in the lack of appropriate information. When looking for help in designing new products and services, firms are usually willing to divulge enough relevant information for external crowds to understand the job at hand. Improving internal processes is a different matter, though. Internal processes are so inherently entangled in corporate operations that just explaining their nuts and bolts to a “stranger” represents a formidable task. Besides, firms often consider their internal processes confidential and, for this reason, are unwilling to provide essential details. Faced with a lack of pertinent information (“Improve this process, but we can’t tell you what this process is all about”), crowds inevitably fail. In contrast, internal crowdsourcing is the least efficient when applied to market-creating innovations: composed mostly of like-minded individuals sharing the same or very similar background and experience, internal R&D teams often lack the critical mass of diversity necessary for coming up with truly innovative product or service ideas. The usefulness of IC increases, though, when applied to sustaining innovations because internal crowds can more rapidly than external amalgamate customer feedback provided by marketing and sales with deep understanding of the firm’s product development and manufacturing capacities. But it is efficiency innovations where IC can be at its best. It’s fair to say that no one in the firm, including members of its management, can better grasp the complexity of the people-to-people interactions internal operations are composed of than the people themselves. When presented with a carefully prepared and articulated questions asking for improvements of internal processes, internal crowds usually respond with a large number of suggestions. None of them, taken separately, can solve the problem entirely; however, when stitched together, as pieces of a puzzle, they may create a “perfect” solution that can’t be developed by any other means. In summary, when turning to crowdsourcing, firms should create capabilities for both internal and external crowdsourcing (perhaps, in this exact order). When these tools are available, careful matching should take place for each tool to be applied to the type of innovation this tool is the most suitable for. This entry was posted in Crowdsourcing and tagged Bartman, Business model innovation, Christensen, corporate innovation networks, Crowdsourcing, External crowdsourcing, IdeaConnection, InnoCentive, Innovation, Innovation Management, innovation tools, Internal crowdsourcing, Jeff Howe, NineSigma, Open Innovation, open innovation services providers, Open Innovation Tools, R&D processes, The hard truth about business model innovation, Unilever Foundry, van Bever. Bookmark the permalink.